The reason the Wolves made the playoffs, under a coach known more for his defensive acumen, was their offense. Because of that, the first two games of the playoffs have been even more annoying for fans. Mitch Hedberg’s excellent and hilarious routine about what happens when escalators break down aside, there is a certain strangeness and discomfort I encounter in those exact situations. It happened to me (again) Wednesday afternoon, approaching an “up” escalator in downtown Minneapolis that was immobile. As Hedberg notes, it was not really out of order. It was just “temporarily stairs.” Even so, walking up an escalator that isn’t moving feels twice as hard as walking up normal stairs. Maybe it’s because each level is deeper than most sets of stairs, leading to strange strides. It could be the grooves and the reflective nature of the escalator material are slightly disorienting. More than anything, though, I think it’s that I’m not able to quickly enough reset my expectations. My experience 99 percent of the time is that I won’t have to do any work on an escalator. Now I’m being asked to do all of it. Anyway, I of course made it to the top and — this is the 100 percent truth — immediately started formulating an analogy between a broken escalator and the Timberwolves’ offense. Several hours later, Minnesota mustered just 82 points in a gruesome display during Game 2 of the playoffs in Houston. So it turns out the metaphor is immediately apt. Where Hedberg’s observational humor really connects, of course, is in the fact that a broken escalator is still quite efficient in the grand scheme of things. If the alternatives are, say, pole vaulting up to the second level or using some sort of pulley system, the temporary stairs will do just fine. The Wolves’ offense, too, was actually quite efficient this season. Minnesota finished fourth in the NBA during the regular season in offensive rating and No. 22 in defensive rating. The reason they made the playoffs under a coach known more for his defensive acumen was their offense. The problem is, the offense, much like a broken escalator, doesn’t feel efficient and doesn’t look like it operates in an efficient way. It often, in fact, feels like the Wolves work twice as hard as they need to order to achieve their objectives. 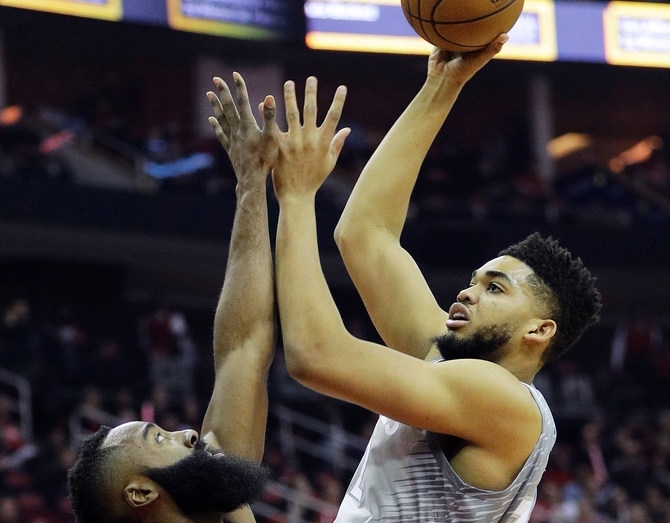 The way this really bears itself out statistically is this: On 13.7 percent of the Wolves’ field goal attempts during the regular season, the nearest defender to the shooter was 0-2 feet away — deemed “very tight” defense by NBA.com. And on 40.1 percent of their shots, a defender was 2-4 feet away — “tight” defense. Both of those were the highest percentages of any team in the league. Conversely, the Wolves had the fewest open shots by percentage and third-fewest wide open shots. Combine that with the fact that the Wolves had the lowest percentage of overall field goal attempts that came from three-point range — shots generally considered efficient — and you’re left to wonder how in the world they were so efficient at scoring. Part of it is attributable to the offensive gifts of their best players who were able to make contested shots. Part of it was their success at getting to the free throw line. As a whole, though, it also can be explained thusly: The Wolves were relatively efficient this season on inefficient shots. They shot 43.6 percent on shots 5-9 feet from the hoop (second-best in the NBA) and 44.3 percent on shots 10-14 feet from the hoop (sixth-best in the NBA). They had to work hard and climb those metaphorical broken escalator stairs to get there, but the Wolves often got there on offense. In two playoff games, though, the offense has been downright ugly. The Wolves are dead last in offensive rating in the postseason (95.5), and even though it’s just a sample of two games the offense has often looked as bad as the numbers would indicate. Through two games, the Wolves are actually getting slightly more “open” or “wide open” looks than they did in the regular season. But here again both traditional and advanced numbers tell a more complete picture. They’re shooting just 13-for-42 on shots between 5 and 14 feet in the playoffs, a dismal 31 percent mark that ranks toward the bottom among playoff teams and is waaaaaay lower than their aforementioned season mark. Part of the inefficiency has to do with who is shooting the ball. Jimmy Butler and Karl-Anthony Towns have shot the ball fewer times, respectively, than Derrick Rose and Jamal Crawford. Butler and Towns combined to take 30 shots per game in the regular season. In the playoffs — again, just two games — it’s a paltry 17.5. Some of that has to do with Houston’s defense. Some of it has to do with Towns and Butler needing to be more aggressive. Some of it has to do with the offensive game plan. All of it is contributing to what could be a very hasty playoff exit. Forget about climbing up a broken escalator. The Wolves right now are falling down one. They might never achieve the smooth automation enjoyed by the likes of Houston and Golden State, but they can at least be competitive with the standard they are used to. If Wild is eliminated tonight, should it get free pass because of injuries?